I completely see the irony in my acknowledgement of a British artist and publisher for a Thanksgiving Holiday tribute today, so just pretend the title mention of Foreign Food is all about turkey and pumpkin pies. 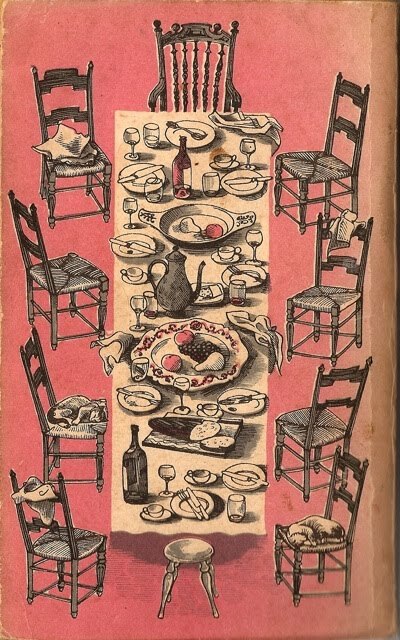 (Nevermind the little penguin on a platter at the bottom of the table.) I simply love how this illustration of a family gathering displays the pre and apres meal scenes on the front and back covers, and the table doubles as the text panel for the plates of mostly handlettered type, while the family is the decorative border treatment. (I'm sure they've been called far worse.) 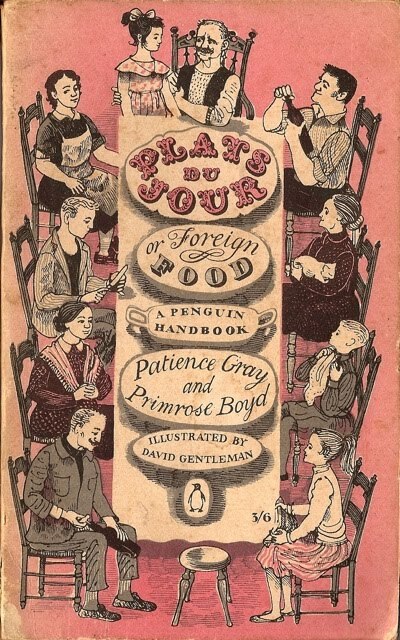 Hats off to David Gentleman who illustrated the Plats du Jour cookbook for Penguin Books in 1957. He just turned 80 this year and continues to work from his home in Camden. There is a great read about Gentleman and his work at Penguin in Fine Books Magazine last year with and excerpt of a 2007 talk Gentleman gave at a gathering of Penguin designers and creatives. Happy Thanksgiving all! I am so grateful there are so many books yet to discover and so many people who still enjoy them!